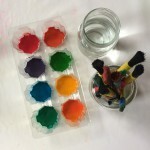 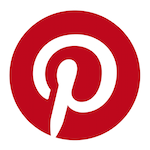 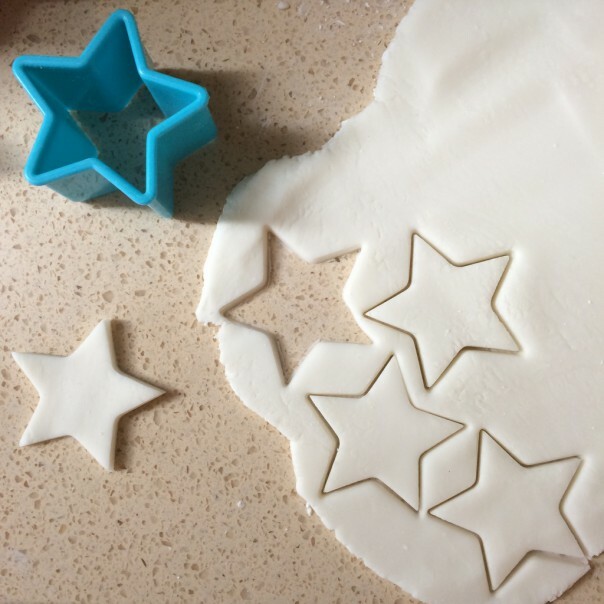 I found this recipe on The Imagination Tree and wish I’d found it earlier, it’s so easy and so much fun. 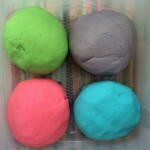 I may never buy play-dough again! 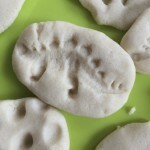 It’s great to model with and can be baked in a low oven to harden and paint if you wish. 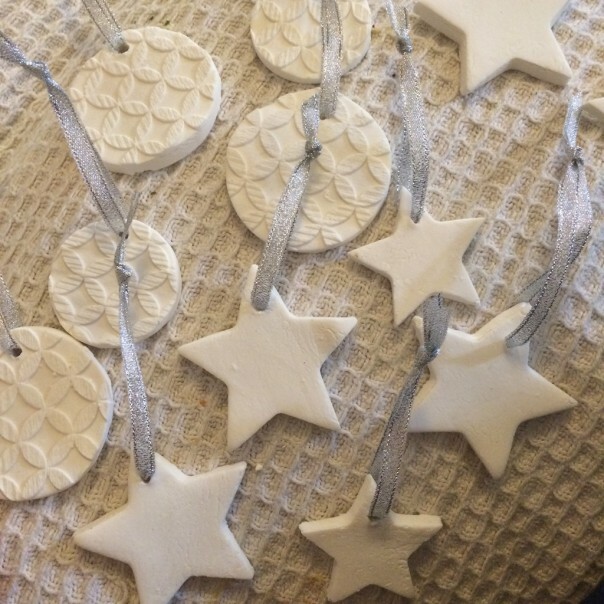 We used the plain white clay to make Christmas ornaments but I can’t wait to add some colour to this mixture to see how it turns out. We did add glitter which made a lovely sparkly clay. Mix dry ingredients in the saucepan and add the water. Stir over a medium heat until it starts bubbling on the surface and eventually pulling away from the sides of the pan (this will take approx. 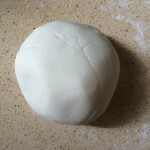 3 – 5 minutes). Leave to cool before tipping onto a work surface and kneading until smooth. Add glitter at the kneading stage if you’d like sparkly modelling clay. 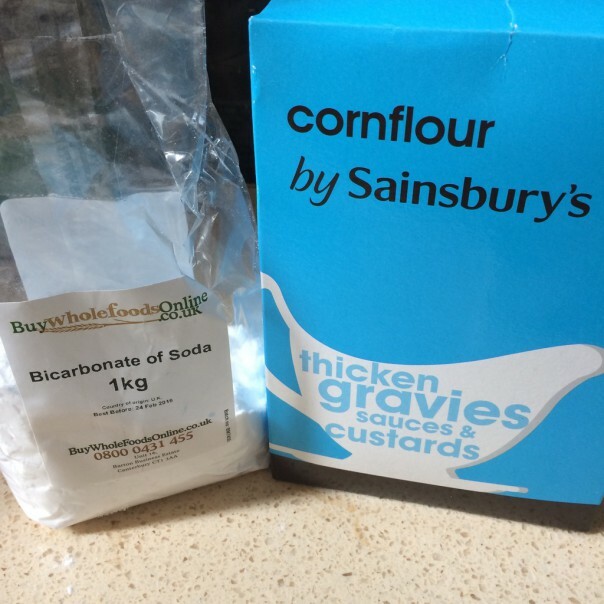 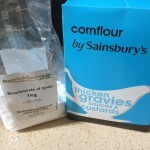 This simple 2 ingredient recipe for modelling clay needs cornflour, bicarbonate of soda (and water). 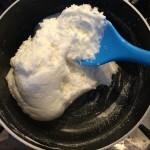 Mix all the ingredients in a pan and stir over a medium heat. Keep stirring! 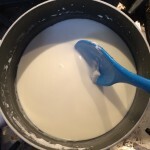 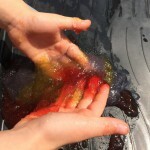 The mixture will bubble on the surface and start to thicken. 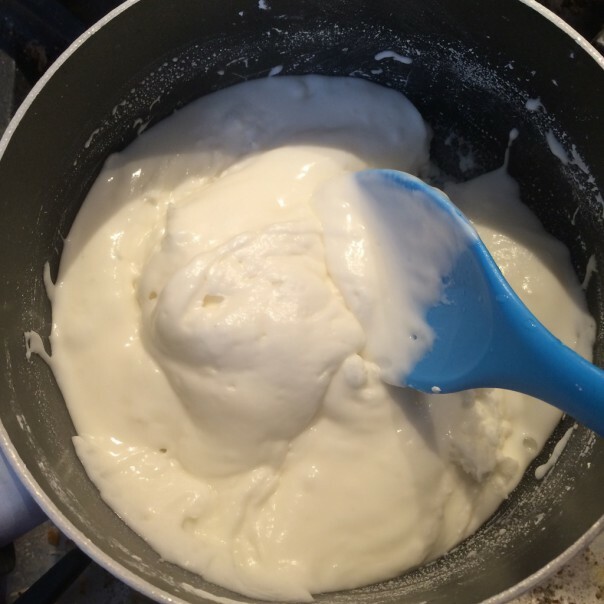 After 3 – 5 minutes the mixture will come away from the sides of the pan and form a soft dough. 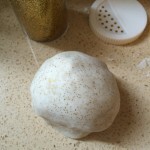 Leave to cool then turn out onto a worksurface and knead until smooth. 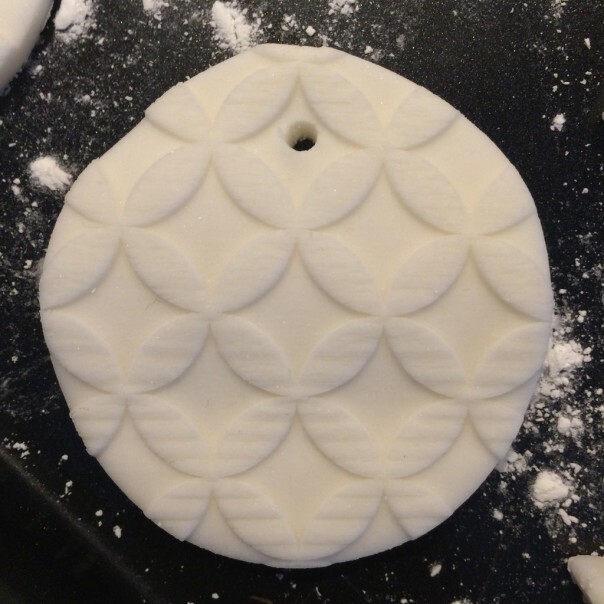 We wanted to make Christmas ornaments with our white modelling clay so I got rolling pins, cookie cutters, a knife and a wooden skewer ready. Roll out the modelling clay and cut shapes. 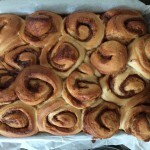 Move to a flat baking tray to dry out. Make a hole at the top with the wooden skewer for ribbon. 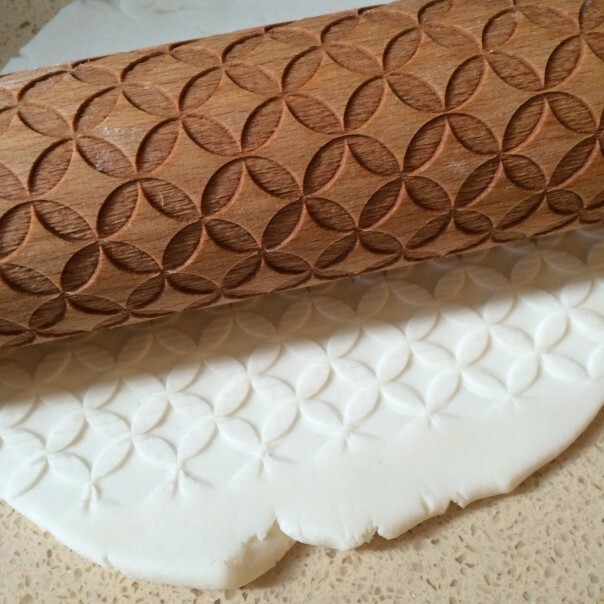 I got given this wonderful rolling pin for my birthday one year and it makes beautiful patterns as you roll. 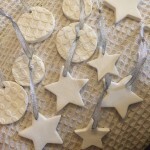 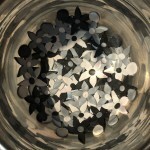 Embossed modelling clay cut into rounds. 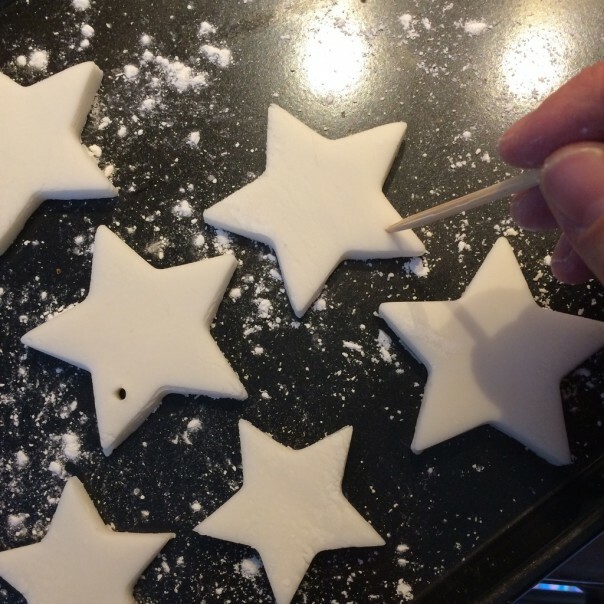 Dry the shapes in a very low oven for a couple of hours, or leave to dry in a warm place for a couple of days. 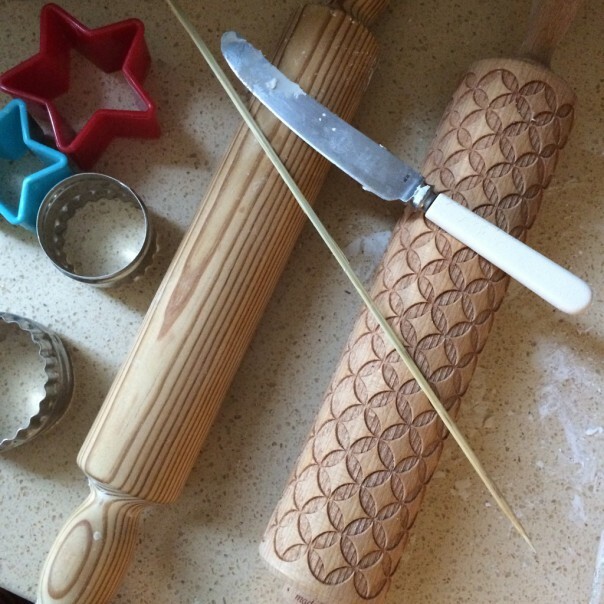 Thread with ribbon, tie a knot to make a loop. 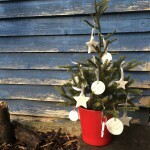 The finished ornaments on our tiny Christmas tree. 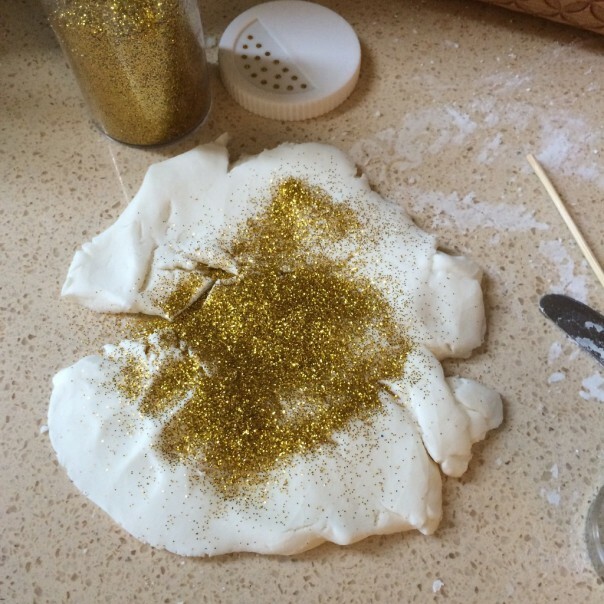 You can also add glitter to your modelling clay at the kneading stage. 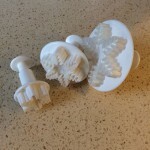 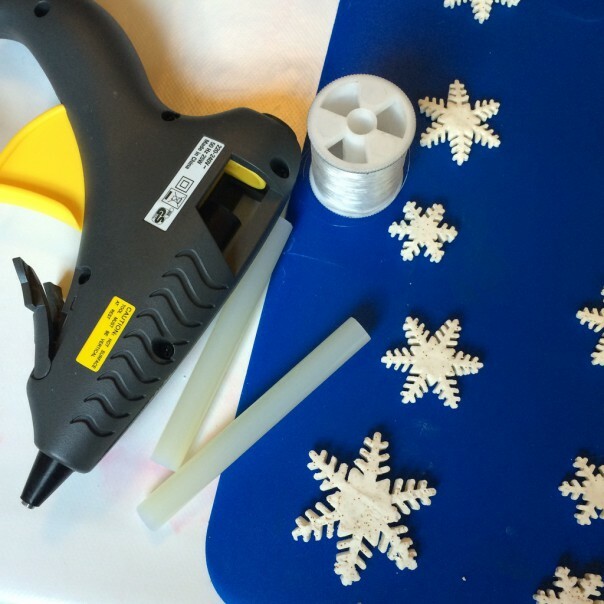 I bought some snowflake icing cutters to use on the modelling clay to make snowflakes to hang from fishing wire in our front window. 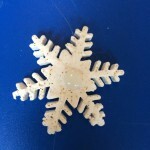 To make a snowflake hanging garland you’ll need dried play clay shapes, a glue gun and fishing wire or invisible thread. 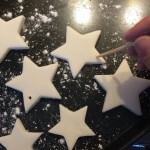 Glue the shapes on lengths of fishing wire or invisible thread. 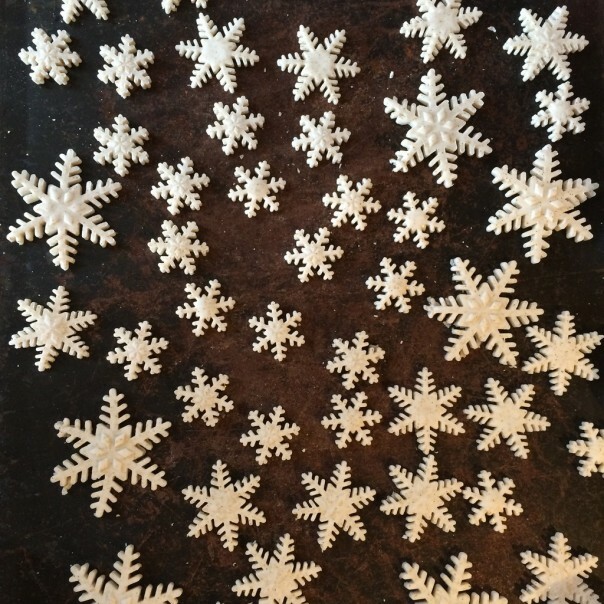 I glued 7 or 8 on a piece of thread the length of our front window. 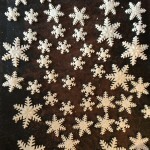 I hung 5 strands of snowflakes in the window.